Peter Mandel My Ocean Liner: Across the North Atlantic on the Great Ship "Normandie": Across the North Atlantic on the Great Ship "Normandie": ... North Atlantic on the Great Ship "Normandie"
My Ocean Liner: Across the North Atlantic on the Great Ship "Normandie": Across the North Atlantic on the Great Ship "Normandie": ... North Atlantic on the Great Ship "Normandie"
Intended for ages 7-12. 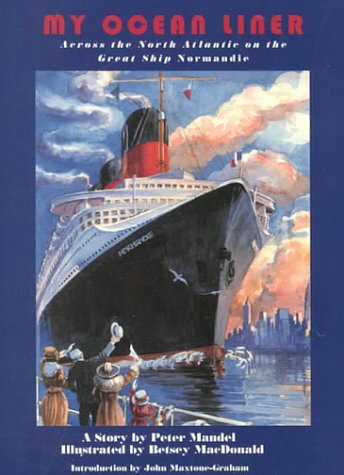 This chapter book recounts the adventures of boy Paul, travelling from New York to France on the ocean liner, Normandie. It describes the pleasures and novelties of life at sea, and the unexpected adventures that Paul encounters. It includes colour illustrations, recreating the details of the liner. This work is intended for ages 7-12. So begins this well crafted chapter book recounting the adventures of boy Paul, travelling from New York to France on the legendary ocean liner Normandie. Unlike the tragic stories of the passengers on the ill-fated Titanic, this one is filled with the pleasures and novelties of life at sea, with friends made and several unexpected adventures for Paul to retell for the rest of his life. As he finishes his tale with nostalgia for the lost world, the reader will share his memories and know something of the look, feel and smell of the ship, and the excitement of being a passenger on a great ocean liner in its glory days. Full-colour illustrations are well-spaced throughout he book, they recreate the grand details of the liner, from its dining room to its engine room. Thoroughly researched by the Normandie, they bring the ship vividly to life. Published by Stemmer House Publishers Inc.,U.S.